There’s a book I purchased while I was walking in the streets of London on French cinema. It’s an amazing book that explores the rich culture and historical evolution of the country that first established the cinema as the most important mass medium of the twentieth century. I decided to write a few posts about the contents of this book. The first chapters offer portraits of such key figures as the Lumiere brothers, Georges Melies, Charles Pathe and Leon Gaumont, and examines the early pioneers who transformed a fairground novelty into a global industry. The crisis caused by the First World War led France to surrender her position as the world’s dominant film-making power, but French cinema forged a new role for itself as a beacon of cinematic possibility and achievement. 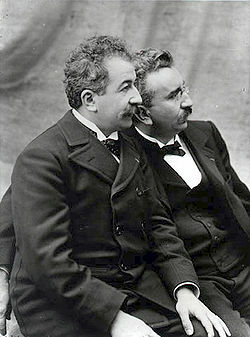 It is the evening of 28 December 1895, in the Grand Cafe on the Boulevard des Capucines that an audience gathered for the first public showing of the Lumiere Brothers’ Cinematographe. On the programme are ten short films, each less than a minute long. The very first of these, called Sortie de l’usine Lumiere a Lyon, shows the Lumieres’ staff leaving work at the end of the day. The Lumiere brothers for the first time capture the poetry of everyday life on the screen. They filmed the sequence more than once. For people who love the cinema, this spot must be a special place. 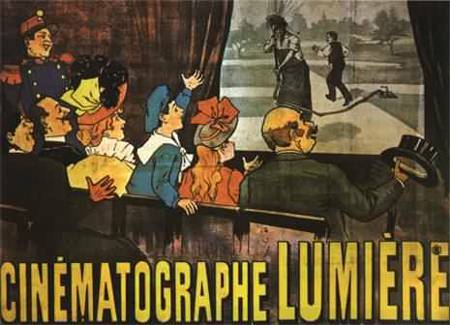 Today, the old factory is home to the Institut Lumiere, which is devoted to celebrating what the Lumieres started. It’s perhaps some measure of the French cultural arrogance that the road outside the Old Lumiere factory was renamed the rue du Premier-Film. It requires only the most cursory acquaintance with early film history to know this to be litterally untrue. The first “film” – as opposed to photographic plate – was first introduced according to the book by George Eastman in 1889 for his Kodak camera. Many attempts were then made by various inventors both in Europe and America to use that film to record moving images, but it was the Edison Kinetograph camera that in 1891 first employed perforated celluloid film for the accurate registration of images and transport through a camera. It was the commercial appearance of Edison’s Kinetoscope in Europe in 1894 that then caused Auguste and Louis Lumiere – who both worked for the family business of manufacturing photographic materials – to conduct their own experiments in moving images.